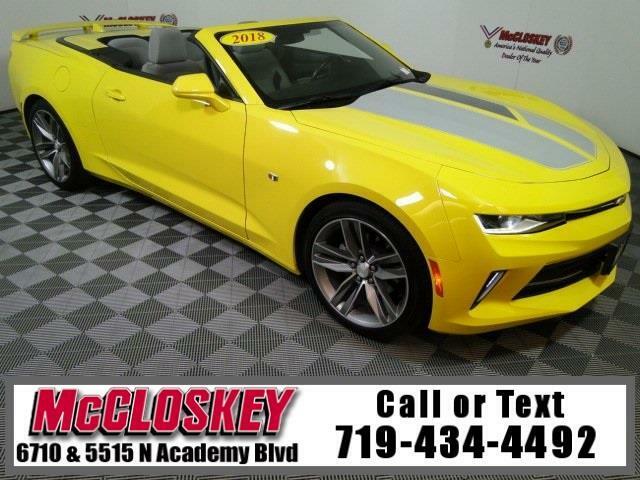 Add excitement to your commute with this 2018 Chevrolet Camaro 1LT Convertible with Remote Start, Backup Camera, Paddle Shifters, and RS Package! Additional gear on the 1LT includes remote start, the aforementioned automatic transmission and steering-wheel-mounted paddle shifters. The RS package (available on 1LS, 1LT and 2LT) includes 20-inch wheels, xenon headlights, LED taillights, a special grille and a rear decklid spoiler. Powering this Chevrolet Camaro is a 3.6L V6 capable of prducing 335 horsepower and 284 pound feet of torque. Bluetooth, Android Auto, Apple CarPlay and two USB ports are standard on every Camaro. This vehicle passed our 110 multi-point inspection and is backed by our National Quality Dealer of the Year Award. We are an ''A+'' Better Business Bureau Rated Business. We offer low interest rate financing, low down payments and the highest trade allowances in the state! Here at McCloskey we do things a bit differently, we shop our competition every day to ensure a great value to you. Come on down and experience it for yourself. This McCloskey Assured vehicle includes a 2 month/2000 mile Warranty and a Vehicle History Report!! At McCloskey we strive to provide ASSURANCE, TRUST, VALUE AND QUALITY! Call 719-434-4492.